This video demonstrates product preparation. Fill a basin with 1 liter of sterile saline. The circulating nurse opens the outer Tyvek pouch. The foil pouch is placed in a sterile field. Rinse INTEGRA® Template for 1-2 minutes, changing saline after every 1-2 sheets, or as needed. 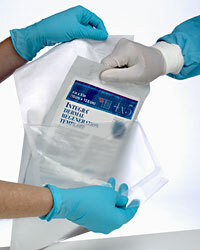 Keep the INTEGRA® Template in the saline bath until application.